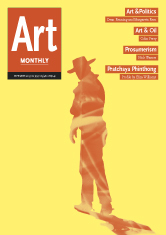 Chris Mc Cormack, Art Monthly’s Assistant Editor discusses a feature and a review from issue 369 July/August Art Monthly magazine with the authors. In the face of government austerity measures which have squeezed artists and public arts provision more than any other sector, an elite art world has continued to prosper. Isn’t it time that, in order to develop political agency in their work, artists begin to acknowledge this glaring dichotomy? This entry was posted in Art Monthly Monthly and tagged 000 Feet is the Best, an elite art world, Art & Politics, art act in opposition to neoliberal power, art monthly, Chris Mc Cormack, commonality and solidarity, Dean Kenning, equality, government austerity, Imperial War Museum, issue 369 July/August Art Monthly, Margareta Kern, neoliberal power, Omer Fast Sophie J Williamson, Omer Fast: 5, political agency, public arts provision, squeezed artists, squeezed public arts provision, transnational capitalist class, Which side is art on ask Dean Kenning and Margareta Kern on October 9, 2013 by artmonthly.